The city boundaries of Casa Grande encompass a 15 mile-wide section of mostly undeveloped desert land, but the downtown area is more compact, centered on the intersection of highways 84, 387 and 287, seven miles from the major I-8/I-10 junction. Facilities are scattered along the 4 miles of Hwy 287 between the town center and I-10, and include Casa Grande Regional Medical Center, Casa Grande Mall and a good selection of shops, restaurants & hotels. The newest stores are on the far side of the interstate - Promenade at Casa Grande. This part of Arizona is very hot in summer, low in elevation and flat, with only occasional hills rising above the desert plains. Some have maintained hiking trails, such as Casa Grande Mountains 4 miles south and Picacho Peak, 20 miles southeast along I-10. There are two national monuments within 20 miles; Casa Grande Ruins (after which the town was named) preserves a 14th century adobe dwelling, while Sonoran Desert contains a vast expanse of peaceful desert lands, with endless opportunities for backcountry exploration. The largest hotel in Casa Grande, AZ, and the only full service establishment near the town center, is the 176 room Holiday Inn, taking up most of one block by the busy intersection of highways 387, 287 and 84. The place was fully renovated after being acquired by the Holiday Inn chain in 2007, and is centered on a sizeable tropical garden with a pool, hot tub, sundeck, lawns and palm trees. The hotel has its own restaurant/bar/lounge, open for breakfast, lunch & dinner, and is close to plenty more restaurants along the main road across town (Florence Boulevard). A complimentary 5 mile radius local area shuttle is provided. 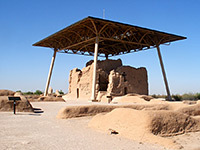 The main attraction in the region (Casa Grande Ruins National Monument) is 22 miles away to the northeast. The 77 room/suite Holiday Inn Express hotel is located a quarter of a mile from I-10 (exit 194) along Florence Boulevard, next to a few fast food restaurants. Accommodations are clean, modern and comfortable, equipped with executive desk, free internet access, coffee/tea maker and mini refrigerator, plus a sofa bed in the suites. Free hot breakfast is served, and all the other standard Holiday Inn Express amenities are available, including an outdoor pool (with patio), 24 hour fitness center, business center and guest laundry. Baymont Inn Casa Grande is reached from exit 194 of I-10, just a short drive west along Florence Boulevard - the hotel is built on the south side of the road, surrounded by farmland. The main commercial and residential districts of Casa Grande are a few miles further west though there is a shopping center with a decent selection of restaurants one block east, and a golf club (Mission Royale) just the other side of the interstate. Rooms are large, clean and quiet, equipped with microwave & refrigerator, and have nice views over the countryside. The hotel provides all the expected amenities - free hot breakfast, outdoor heated pool, hot tub, newsstand, exercise room and guest laundry. The Quality Inn has a peaceful, countryside setting 2 miles east of the center of Casa Grande and just over a mile west of I-10 (exit 194); the hotel is surrounded by fields on three sides, while to the north, on the opposite side of Florence Boulevard, is the Casa Grande Regional Medical Center. The 80 room hotel is well regarded, on account of the quiet location, reasonable rates, good staff and the nice (free) breakfast. The main amenities are a fitness center, hot tub, bbq grills, and a heated outdoor pool set amid tree-shaded gardens. For lunch and dinner there is a Denny's restaurant adjacent. For extended stays in the Casa Grande area, or for those people needing extra space & facilities, the new MainStay Suites hotel along Henness Road offers large, well maintained suites with fully equipped kitchens and many other amenities. Henness Road is 1.1 miles east of exit 194 of I-10, part of a residential/rural area, 2 miles from the center of Casa Grande. The hotel serves basic free continental breakfast and has facilities of an exercise room & guest laundry, though no pool. Room rates are quite low. Although situated along the main road into Casa Grande from the east (Florence Boulevard), the Super 8 motel is set back 400 feet from the highway, behind an IHOP restaurant, and so provides a quiet night's stay. I-10 runs past half a mile east, with the 50-store Promenade mall just beyond; the city center is 3 miles west. The adobe-style motel has interior corridors, and amenities of free continental breakfast, free wi-fi, guest laundry and a tree-lined outdoor pool.